Algebraic code-excited linear prediction (ACELP) is a patented speech coding algorithm by VoiceAge Corporation in which a limited set of pulses is distributed as excitation to linear prediction filter. The ACELP method is widely employed in current speech coding standards such as AMR, EFR, AMR-WB (G.722.2), VMR-WB, EVRC, EVRC-B, SMV, TETRA, PCS 1900, MPEG-4 CELP and ITU-T G-series standards G.729, G.729.1 (first coding stage) and G.723.1. 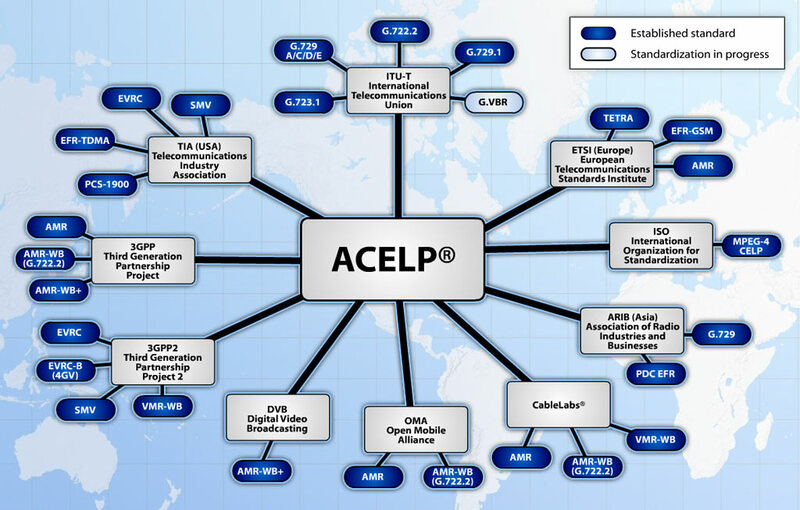 The ACELP algorithm is also used in the proprietary ACELP.net codec. ACELP is a patented technology and registered trademark of VoiceAge Corporation in Canada and/or other countries and was developed in 1989 by the Université de Sherbrooke in Canada. The main advantage of ACELP is that the algebraic codebook it uses can be made very large (> 50 bits) without running into storage (RAM/ROM) or complexity (CPU time) problems. The ACELP algorithm is based on that used in code-excited linear prediction, but ACELP codebooks have a specific algebraic structure imposed upon them. A 16-bit algebraic codebook shall be used in the innovative codebook search, the aim of which is to find the best innovation and gain parameters. The innovation vector contains, at most, four non-zero pulses. In ACELP a block of N speech samples is synthesized by filtering an appropriate innovation sequence from a codebook, scaled by a gain factor g c, through two time-varying filters. ^ VoiceAge Corporation (2007-10-13). "Codec Technologies". Archived from the original on 2007-10-13. Retrieved 2009-09-20. ^ VoiceAge Corporation. "Codec Technologies". VoiceAge Corporation. Archived from the original on 18 October 2009. Retrieved 2009-09-20. ^ VoiceAge Corporation. "ACELP.net — Beyond the Standards". Archived from the original on 2007-10-14. Retrieved 2010-01-03.